San Diego, CA (November 6th, 2018) – IDW Games and Nickelodeon invite you to a pizza party with the new shell-shocking card game, Teenage Mutant Ninja Turtles: Ninja Pizza Party! Take on the role of pizza chefs in this race to make the most extreme pizzas, using crazy ingredients for your favorite Teenage Mutant Ninja Turtles characters. The pizza orders are in and you’re the chef of honor! This new card game, Teenage Mutant Ninja Turtles: Ninja Pizza Party, designed by Prospero Hall (Harry Potter: Hogwarts Battle, Hullabaloo), has players creating the most extreme pizzas for the Turtles and their friends. These guys are mean, green, pizza-scarfing machines and you’ll have to work fast to get these heroes their pizza. 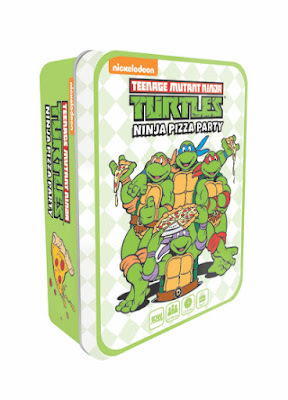 Teenage Mutant Ninja Turtles: Ninja Pizza Party is delivered in a collector’s tin and includes 60 pizza slices with crazy topping choices such as toasted marshmallows, banana slices, cheese puffs, popcorn, and more! Designed for 2-6 players and for fans of all ages, get ready for action in the kitchen and make a pizza for your favorite Turtle! Teenage Mutant Ninja Turtles: Ninja Pizza Party will be delivered to your friendly local game store in March 2019 for $19.99. For more information about this upcoming game title, follow IDW Games on Facebook and Twitter. More Nick: IDW Games To Release 90s-Nick Themed 'Nickelodeon Splat Attack!' Board Game In February 2019! Sources: Newsarama, Comics Now, The Fanboy Factor.